Noumeda Carbone’s 6x4m wall painting “Unmapped 7” is stunning and profound: a web of intertwined vein-like forms spans across a weightless space, severed at the center. Like a butterfly split into two or a severed lung, the arterial shapes breathe both life and pain at once. “Unmapped 7” shows simultaneous connectivity and disconnect: Noumeda’s interpretation of the theme of HAYP’s exhibit “ANKAPital”, which takes a closer look at “ankaputyiun” (disconnected or non-sensical in Armenian). Carbone has been developing these “Unmapped” forms over the past few years, as seen in her wall painting from the 2012 Castro Street Art Project in Tel Aviv and in several live painting performances in Florence, Italy. I like to give myself limits” she tells me, “I’ll work with a single form or shape in repetition, and push myself to see how far I can take it. There’s a certain rhythm and multiplicity that comes out of limiting the elements with which I work, like color and shape, an almost obsessive multidimensionality. I am very inspired by nature and creating parallel spatial dimensions”. And in fact, what I like the most about Noumeda’s work is her ability to create deep spatial dimensions despite her minimalist graphic style. Her work conveys a fine balance and harmony between the simple and the complex. 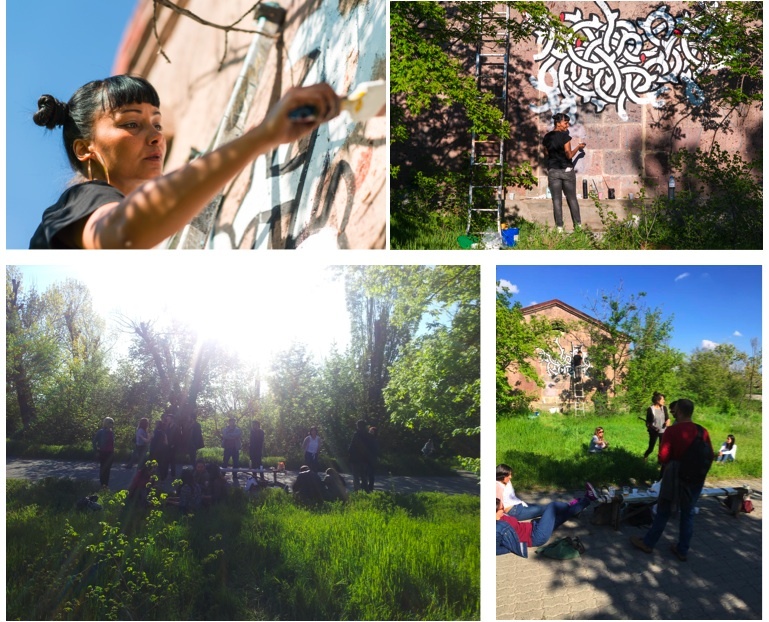 Noumeda also created a second site-specific art piece in Armenia for HAYP Pop Up Gallery, this time in a public location at Victory Park thanks to the support of Zeitun Municipality. The wall painting was a public performance that took place last Saturday, April 25th from 2pm to 8pm in the company of dear friends, curious wanderers and art lovers who gathered under the sun with some drinks and snacks to see her creative process in action. Noumeda’s work has been commissioned internationally, and her clients include VOGUE-TRENDS, Ferragamo, Leo Burnett, Pitti Immagine, The Guardian, Kult Magazine among others, and her works have been featured in Juxtapoz Magazine and Hi-Fructose. 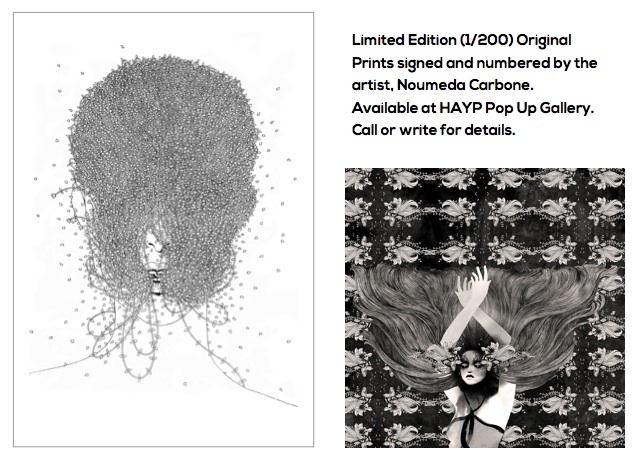 We are happy to say that now she can add HAYP Pop Up Gallery to her list of collaborators and Armenia to her list of international destinations! You can come by the gallery to see Unmapped 7 in person on appointment (as of the 27th, “ANKAPital” is officially closed). We also have available signed and numbered Limited Edition prints for the investment savvy Collector that are available also on appointment. Contact: info.hayp@gmail.com | +374. (0)99.741.626 . Anna K. Gargarian. Reblogged this on NOUMEDA CARBONE news|shop.